Slender and upright low growing glads (no staking required) that deserve a prime spot in a casual border or mixed perennial garden .The flowers grow on loose spikes and are usually 2" / 5 cm in diameter. The foliage is narrow and sword-shaped. They are hardier, bloom earlier and have a softer, less formal look than the (standard) large-flowered gladiolus. In borders and as cutflowers. 'c. 'Albus' (white), n.'Amanda Mahy' (red), p.'Atom' (red, white edge), c.'Bride' (white), n.'Carine' (cream, purple lip), t.'Charm' (purple), t.'Charming Beauty' (pink), t.'Charming Lady' (lilac), n.'Elvira' (pink, red lip), n.'Halley' (cream, red lip), n.'Impressive' (pink, red lip), p.'Mirella' (red), n.'Nathalie' (pink, red-yellow lip), n.'Nymph' (white, red lip), n.'Prince Claus' (white, red lip) and r.'Robinetta' (dark red). 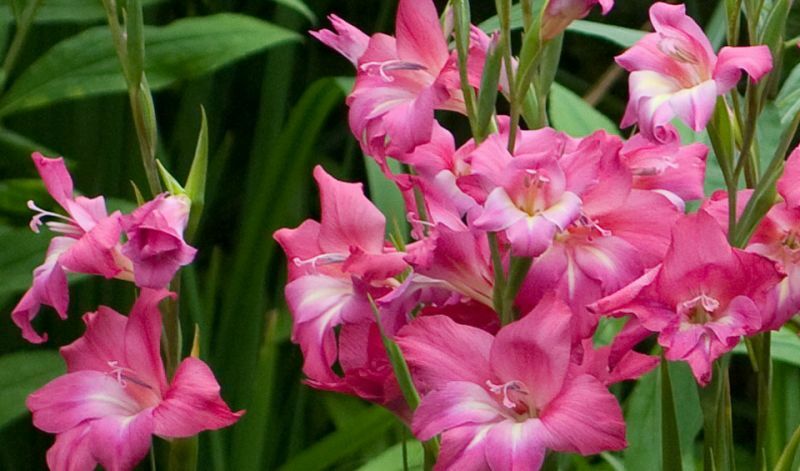 Primarily from South Africa but some gladiolus were native to the Canary Islands, England and Turkey as well. The name Gladiolus comes from the Latin word 'gladius', meaning sword and refers to the plant's sword-shaped leaves. The word 'gladiator' is from the same root word.